Fed up with not being appreciated at her job as assistant manager at a grocery store, Maya (Jennifer Lopez) decides to quit. Since she doesn’t have a college degree, she is passed over for promotions and has few prospects for getting a better job. Dilly (Dalton Harrod), Maya’s godson, creates a fake resume for Maya and posts it online. This leads Maya to a job at one of the firms that makes skin care products she sold at her previous job. Brought on as a consultant for the company based on her fake credentials, Anderson Clarke (Treat Williams) puts her in charge of creating a completely organic version of one of their products. Anderson pits Maya against his daughter Zoe (Vanessa Hudgens), who is going to revamp one of the products to make it more organic. Maya and Zoe are now in a competition to see who can create the better product with the highest profit margin. Maya’s team, consists of the less popular candidates, Hildy (Annaleigh Ashford) the quirky Ariana (Charlyne Yi), and a nerdy scientist Chase (Alan Aisenberg). Zoe’s team, on the other hand, consists of the top minds from the company. With the deadline for the competition nearing, Maya and her team struggle, suing Maya’s methods while Zoe’s team is nearing completion. Wrapped up in her new work life, Maya is alienating herself from her friends and her boyfriend while burying herself deeper in her lie. Will she be able to pull everything together, saving her new career as well as her personal life? Aiming for lighter fare than what we usually see this time of year from films vying for Oscar contention, Second Act is the type of rom-com we typically see in January when we’re all longing for a break. Jennifer Lopez stars Maya, a woman who knows what she wants but not how to get it. Her birthday wish was to get an equal chance given what the life she has been handed. It’s a fair wish and one many people experience. Leah Remini, playing Maya’s best friend Joan, gets most of the funnier lines. Granted, most of these rely on her swearing around her children and their repeating her language. Fortunately, they abandon this fairly quickly, turning the comedy to Joan finding ways to swear while not swearing. Vanessa Hudgens’ Zoe is Maya main adversary. She does fine given the script she’s working with. The rest of the cast try to fill out the film with more comedy and some heart, but it never really gets there. The story, while an important, relatable one, never gets a chance to go anywhere. A second storyline pops up relatively quickly and takes over the movie. There isn’t much build up to it, making it feel like the writers didn’t know which story they wanted to tell. They also don’t give a good explanation for how this arc gets to the point it does, aside from a passing conversation. The film is a short 1 hour 43 minutes, so neither story gets proper development and then rushes to resolution. 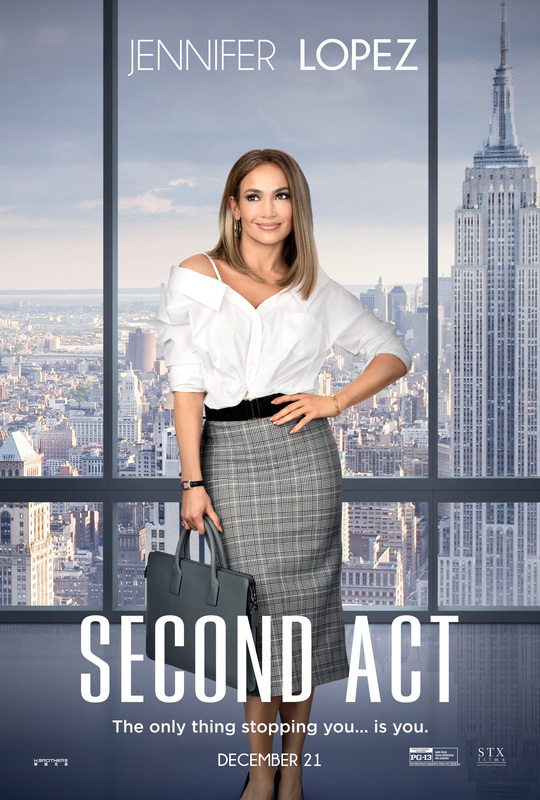 With predictable plot points, some easy jokes, and blatant attempts to pull at your heart, Second Act feels more like a Hallmark movie than a theater release. Not that it’s a terrible movie, but I would definitely wait to rent this one. There are many better choices for a night out over the holidays.